Here we are. Ten years. When I went to see Iron Man in 2008, I had no idea what we were about to embark upon. Steadily and surely, Marvel has built an entire universe on screen, earning it brick by brick. Now, ten years and eighteen movies later, we’re finally here. This is what it has all been building to. This review will be divided into two halves. The first half will be my general spoiler-free thoughts, and the second half will be my spoiler-filled experience of the movie. That being said, it’s probably best to go into this movie knowing as little as possible. Consider that when reading further. Infinity War is an unprecedented cinematic event. The Russo Bros. have succeeded in bringing a comic-book to life, weaving together ten-years’ worth of stories and characters. In this, the movie is very much a success. Infinity War offers all the thrills and spectacle you could hope for. It is chock-full of wish fulfillment for comic-book readers, and in short, if you like the MCU, you should absolutely go see this movie. It’s good. Thanos is a villain of conviction and faith in what he is trying to accomplish. His motivations are clear, believable, and sympathetic. He believes he’s right, and the movie wastes no time in showing that he is willing to do whatever it takes to right the wrongs he perceives in the universe. This is his story. Infinity War is very much Thanos's movie, and I do like it for that. His Black Order, comprised of four alien beings, are another matter. They serve as cool figures for the Avengers to battle in their separate locations in time and space, but they offer little else. Every Marvel hero we’ve been following for the last ten years gets their moment to shine in this movie, and those moments are an absolute delight. I especially wish I could shake the hands of the Russo Bros. for giving us the payoff for Thor that he should have gotten in Ragnarok. If any hero steals the show in Infinity War, it’s Thor, and I’m grateful for that. A large part of the fun in this movie is seeing many of these characters meet and interact for the first time. Whether it’s the substantial egos of Stark and Strange butting heads, the one-sided rivalry between Starlord and Thor, or the wide-eyed wonder of Peter Parker on a crazy adventure, these moments are really great, and result in a lot of genuine humor. And thankfully, the humor knows its place, and mostly doesn’t overstep its bounds. Infinity War does what Marvel movies do, and it arguably does it bigger and better than ever before. But it doesn’t do anything more than that. It is epic in scale, grand in spectacle, and filled with moments that comic-reading fans have been waiting to see. I was hoping it would elevate itself above the rest of the MCU and offer real stakes, tragic consequence, and dramatic weight. It tries to do that, but I felt very little of anything during the process. The emotional dimension of the story is sorely lacking. This movie, perhaps more than any other so far, thoroughly succeeds in putting a comic-book on screen. And Infinity War, without a doubt, is a fantastic comic-book movie. But that’s all it is. If you were expecting something more, you might want to temper those expectations a bit before you go see it. Which you absolutely should. That’s all I can say without spoiling anything, so this is where the spoilers will begin. You’ve been warned. The Russo Bros. came out and said this is a complete story, and while it will be connected to the next Avengers movie next year, Avengers 4 will be its own thing. They made a point of saying this will not be a part-one, part-two scenario. Bullcrap. It’s a cliffhanger. It leads directly into the next one. Whether those statements were simply misdirection or the Russo Bros. actually believe what they said, it doesn’t matter. It’s not true. Consequence and permanence is something that comic book movies in general have a hard time with, and the MCU specifically struggles with. I thought Infinity War would change that. But it doesn’t. This stems from a couple of issues: In a movie where time, space, and reality can literally be molded into whatever you want, nothing is really of any consequence. Even when familiar and perhaps beloved characters were being snuffed out of existence before my eyes, I wasn’t feeling much of anything. We know this can be undone. There’s also the fact that Guardians 3 and a Spider-Man: Homecoming sequel are already announced. We know these characters aren’t gone for good. The closest I came to an emotional reaction was watching a terrified Peter Parker cling to his father-figure Tony Stark. That moment was earned by the pre-established relationship, and was by far the most impactful of the "deaths." And to be fair, there are some breathless moments when characters are coming undone, and you are left wondering, "Who is it going to be next?" But the message is made clear: everyone is expendable, except for Iron Man, Captain America, and Thor. After ten years of buildup...I’m still waiting. After being told “THIS IS IT”…no, it’s not. And I find myself in a position that I’ve really come to dislike in this age of cinematic universes: So much about Infinity War depends on what comes next. 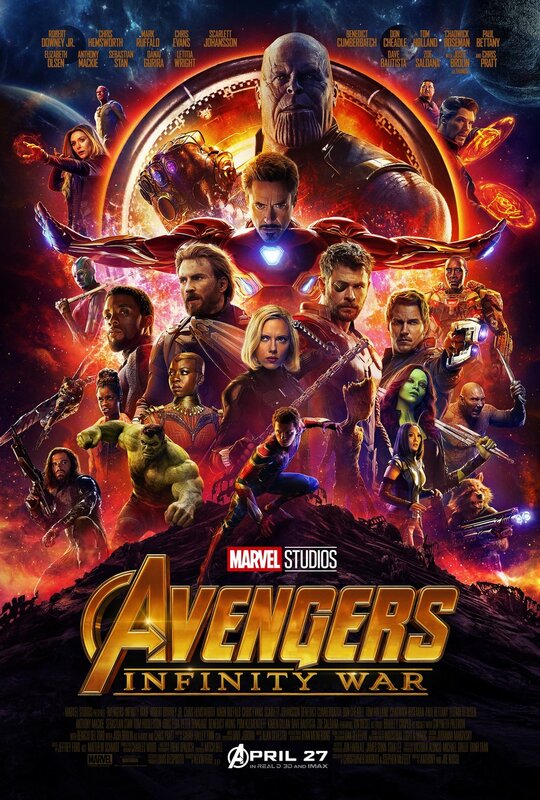 But as of right now, taking Infinity War for what it is on its own, it’s an epic spectacle, but not really a satisfying one. It doesn’t have the guts it should have had, emotionally or dramatically. In summary, I had a fun time watching Infinity War, but felt almost nothing. While I do partially admire the movie for rolling the credits without wrapping everything up in a neat little bow, ultimately the experience feels a little hollow. And I’m left hanging for another year. So I guess we’ll all wait and see how this turns out. I might have more thoughts later. But for now, thanks for reading.